A clever title for a documentary on the Pacific island of Kikibati. The nation of Kiribati (population: 100,000) is one of the most remote places on the planet, seemingly far-removed from the pressures of modern life. Yet it is one of the first countries that must confront the main existential dilemma of our time: imminent annihilation from sea-level rise due to global warming from climate change. The film opens with a shot of the island surrounded by crystal clear blue waters. The island is described as the corners of the earth as it streets north and south and east and west of the international date line. The fishing scene also shows how rich the waters are. 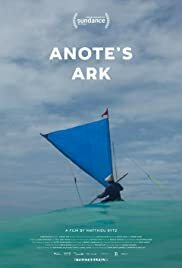 Anote is the then President who needs to build an ark for the nation to survive the flooding, similar to Noah building an ark to save the animals from the world flood. The film documents the desperation of the people as the tides rise and flooding occurs. Lots of footage here including scenes of devastation resulting from the floods. While Kiribati’s President Anote Tong races to find a way to protect his nation’s people (he attends the Paris Climate change Conference with other world leaders including ex-U.S. President Obama) and maintain their dignity, many Kiribati are already seeking safe harbour overseas. The film follows one such couple who sees New Zealand as their new home. Both director Matthieu Rytz, and subject President Anote Tong will be present during the Hot Docs screening.